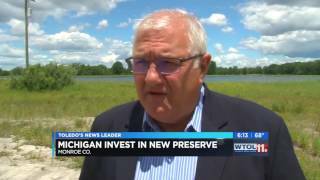 Senator Dale Zorn, R-Ida, supported the Natural Resources Trust Fund project to help transform an old quarry into a state game area. 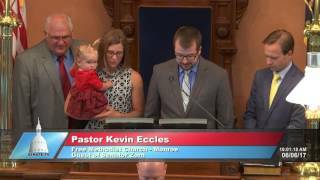 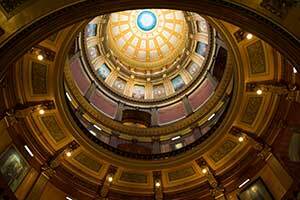 Senator Dale Zorn, R-Ida, welcomed Pastor Kevin Eccles of Free Methodist Church in Monroe to the Michigan Senate to deliver the invocation at the start of the June 6, 2017 session. 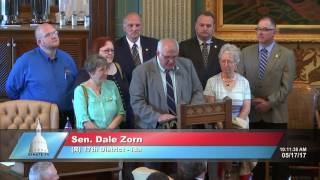 Senator Dale Zorn, R-Ida, recognized the 200th birthday of Monroe County at the Michigan Senate during the May 17, 2017 session. 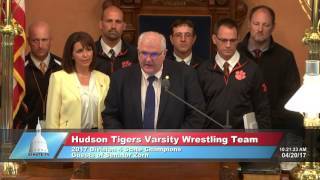 Senator Dale Zorn, R-Ida, welcomes the Hudson Tigers Varsity Wrestling Team to the Michigan Senate to celebrate their 2017 Division 4 state championship during the April 20, 2017 session. 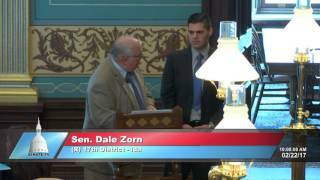 Senator Dale Zorn, R-Ida, honored Corey Welch for his service to the Michigan Senate during the Feb. 22, 2017 session.